great price, Finisar Compatible works perfect. 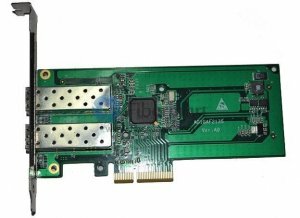 PCI/ PCI-E Network Adapter Card is also called PCI Network Adapter, PCI Network Card, or NIC for short. It acts as the interface between a computer and a fiber optic network cable. The purpose of the fiber optic network card is to prepare, send, and control data on the network. Fiber-Mart supply 100M, 1000M, and 10G fiber optic network card Adapter. Our fiber network interface cards are available in both Multimode and Single-mode configurations with ST, SC, MTRJ, or LC connectors, and SFP for Gigabit.